Welcome to Trinitybox. Trinitybox produce beautiful, unique, personalised scrolls using parchment or handmade paper for all occasions. 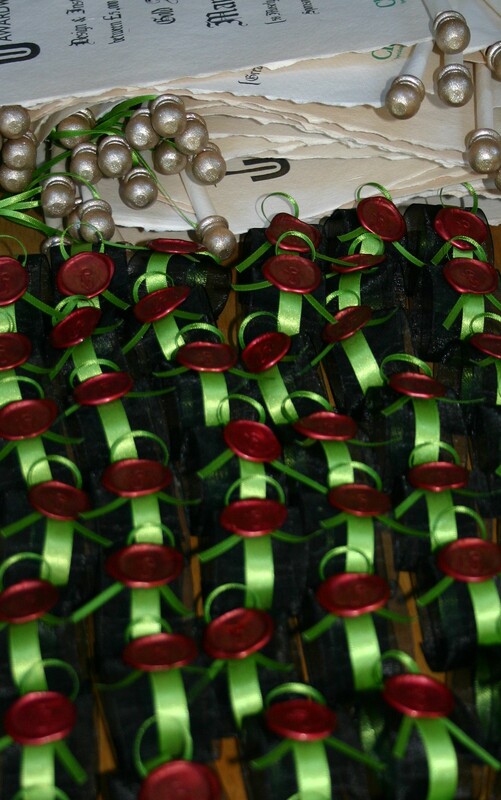 Each scroll is handcrafted with the utmost care and attention to detail and will not fail to impress. 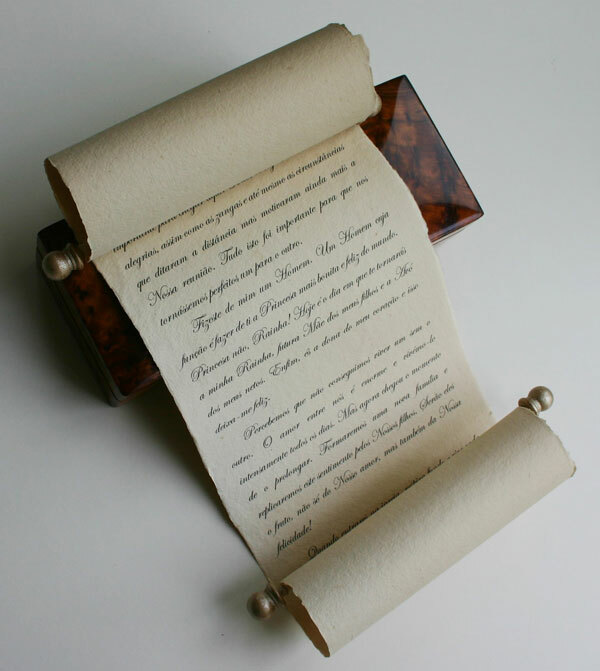 I will work closely with you to ensure that your scroll is exactly as you imagined it would be. Trinitybox will give you a truly personalised experience. If you have an idea in mind that isn’t pictured on the website, I would me more than happy to work with you to achieve your bespoke scroll. 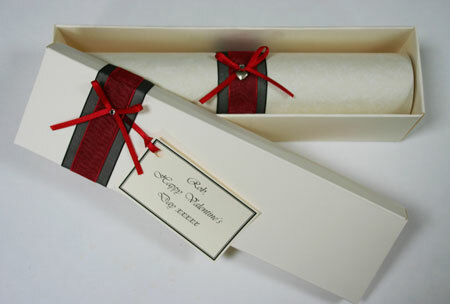 There are 4 different collections of gift scrolls – the classic, premium, luxury and quotation scrolls. Each collection has its own look and feel and will suit every budget. 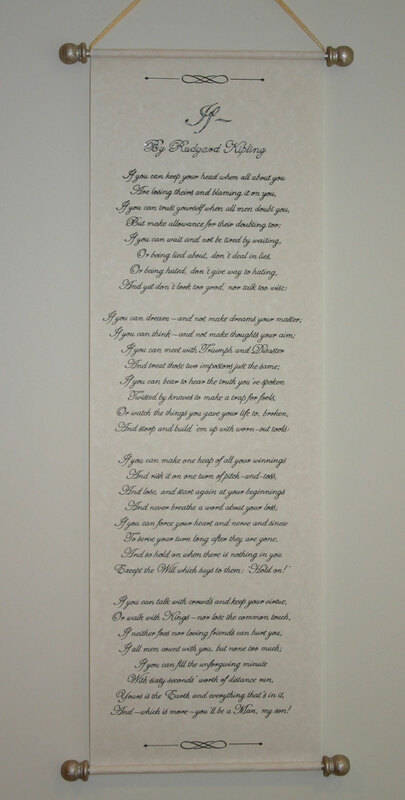 Any message, poem, prayer, speech or quotation can be printed or handwritten onto your scroll. 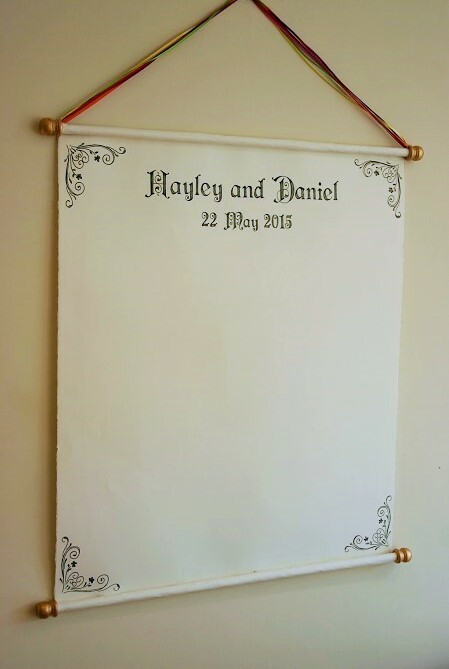 The scroll can be personalised at no extra cost with names and dates. 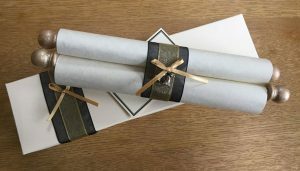 The gift scrolls are perfect for conveying a message for all occasions such as Weddings, Birthdays, Baptisms, Wedding Anniversaries (especially first as this is paper), Proposals, Christenings, Graduations, Mother’s/Father’s day, detailing an experience gift, to say thank you, to give a word of encouragement at a difficult time such as a bereavement, or simply to show someone you care. All these scrolls are beautifully presented; the scroll is trimmed with ribbons and a charm or wax seal and presented in a box with a gift tag and coordinated ribbons. 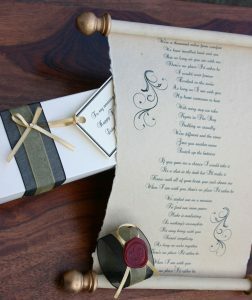 A proof of the scroll will be emailed to you with every order, to ensure everything is correct before printing/handwriting. 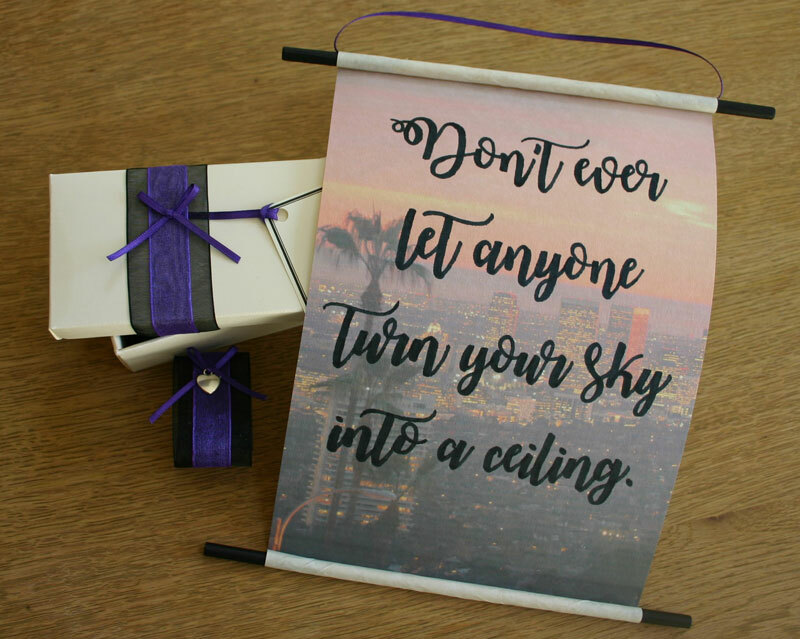 Trinitybox can also offer a personalised poem service for those occasions where you know what you would like to say, but don’t quite know how to express it. 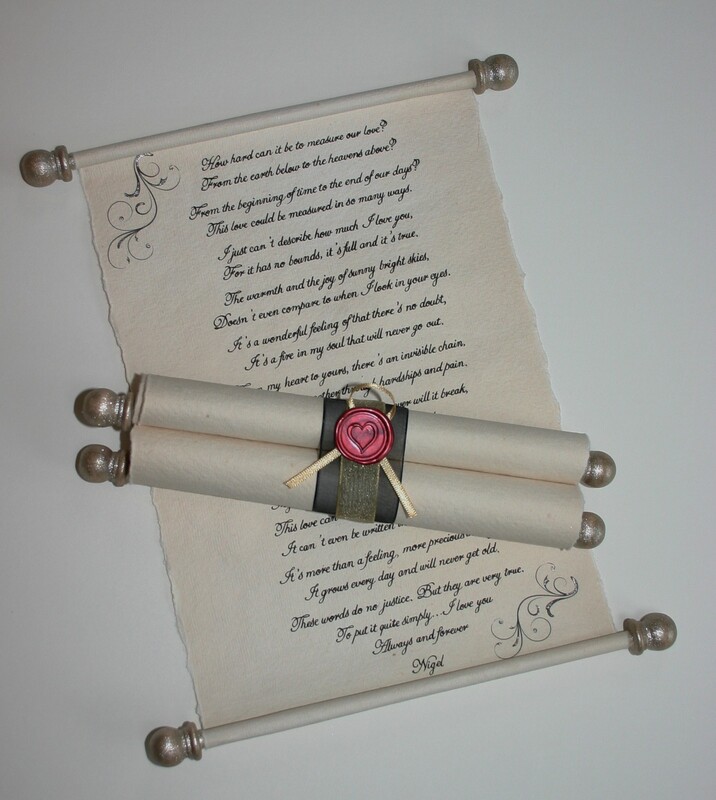 Your bespoke poem can then be printed or handwritten on to any of the scrolls from the collections. 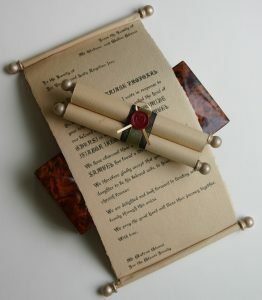 Pictured below are scroll samples from each collection. Please click here for more information of the gift scrolls which will provide more detail about the differences between the 4 collections. 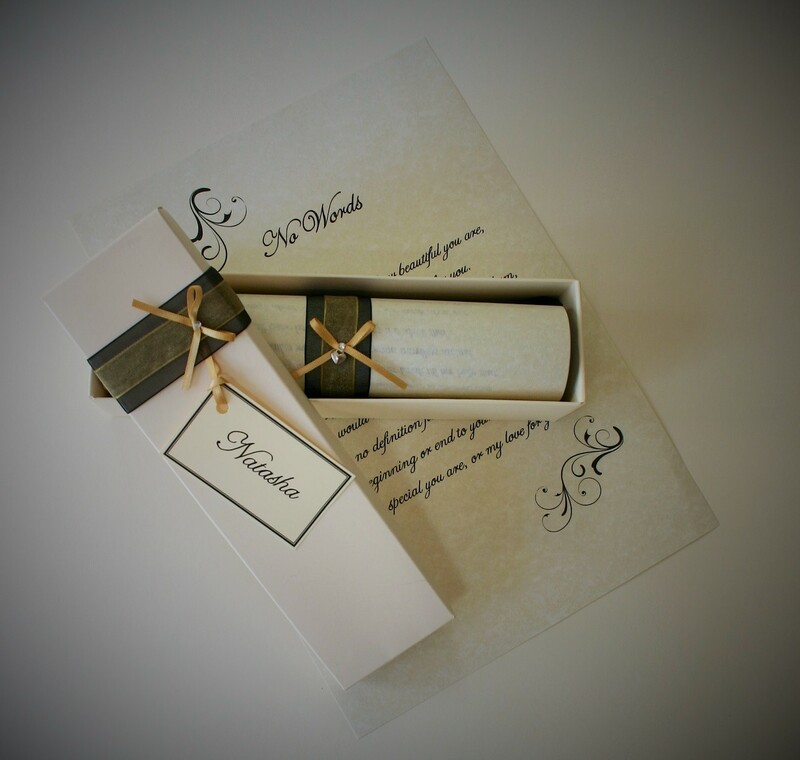 The Classic, Premium and Luxury collections are made in 3 different sizes depending on the length and format of the text to be printed/hand written. 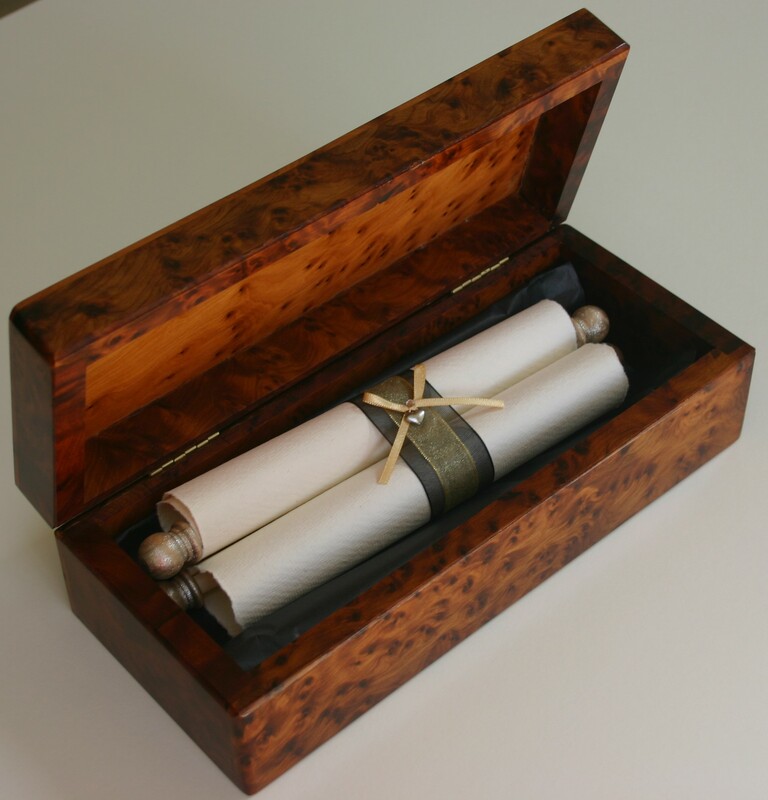 Any of the scrolls can be presented in this beautiful wooden box which would make a beautiful addition to any home and a perfect way to treasure your scroll for years to come. Please click here for more details on the wooden box. Trinitybox also hand make very unique invitation scrolls for all events such as Weddings, Christenings, Birthdays and other occasions. These make a wonderful first impression of your event, and a nice keepsake of the occasion for your guests. 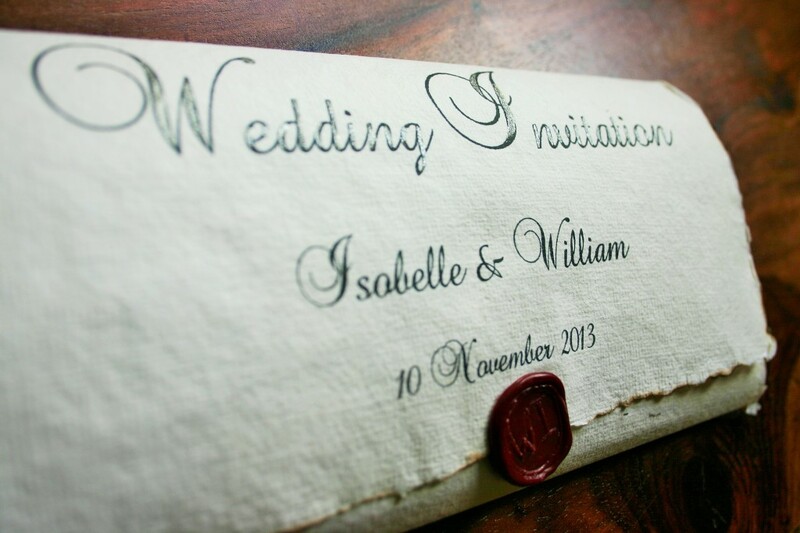 This collection of invitations has something to suit every budget. Please see the scroll invitation page for further details. If you are planning a Wedding, as well as scroll invitations for the Big Day, other options include a Proposal scroll, Wedding Vow scrolls, Wedding reading keepsake scrolls, Wedding speech scrolls, a guest book alternative scroll, gift scrolls for Bridesmaids and Best Man and other special guests. Please see the Wedding page to discover more. Trinitybox produces certificate scrolls for any corporate event. 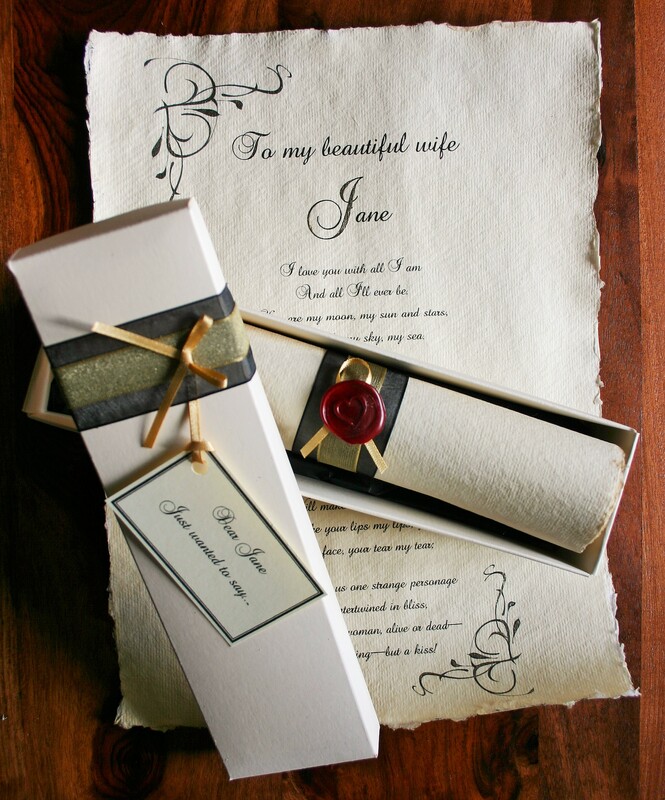 I will listen to your requirements and work with you to create a scroll to suit the occasion perfectly. Please see my Corporate certificate scroll page for more details. 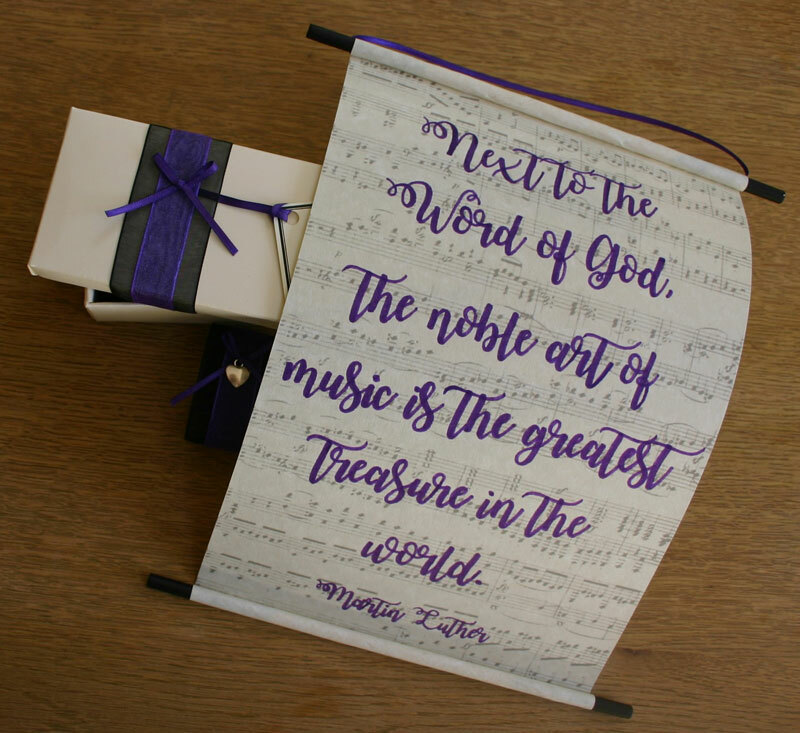 I love custom making any scroll, so if you have an idea or design in mind that you haven’t seen on my Website pages, please don’t hesitate to contact me to discuss. If you've ever considered buying something like this for someone you love, definitely come to Emma. She was wonderfully kind and willing to listen and cater for all requirements, and when the product arrived, it was flawless. Would 100% come back here again, and cannot recommend Emma's talents enough. If you're looking for a unique look, then look no further, because you've found it. 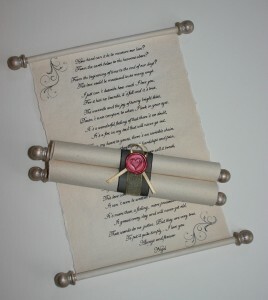 Emma was an absolute star and delivered a fantastic final scroll for a friends daughter's 18th Birthday. She really went the extra mile in sourcing paper and printer for what was a tricky job and communication was brilliant all the way through. Thanks so much and would highly recommend your services. I am impressed and absolutely delighted with the personal service provided. 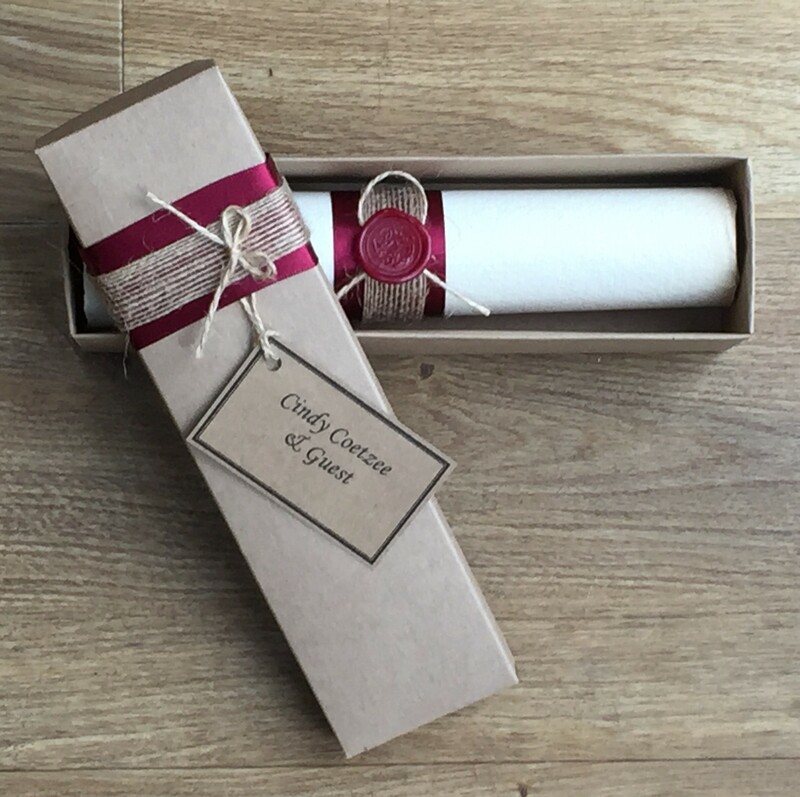 We have received a lovely personalised scroll of high quality. It has made the job of getting a wedding present so much easier and I am very grateful. So hurry up to select what you like hockey jerseys make you attract more attention. It will save you much money hockey jerseys at wholesale price can reach you.